Earthworms and Marmalade: Granny Square Blanket for my bro! Granny Square Blanket for my bro! This is a blanket that I made for my bro this Christmas! Granny Squares are new to me, but I always like to have a purpose when I knit/crochet. I made lots and lots of gray and black Granny Squares. We all know, and love, our good friend, Pinterest! 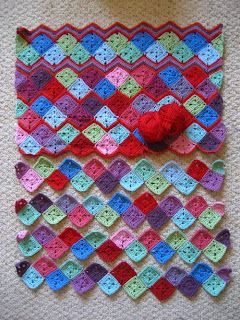 I found all kinds of information on joining my granny squares and making a border. Thanks a million to my brother for taking the images below for me. Not too shabby for a first timer! I found how to join my granny squares in a zigzag pattern at Attic 24.